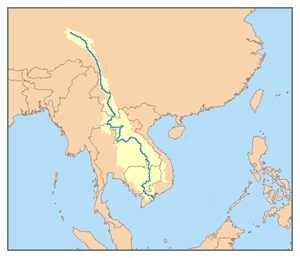 Map of the Mekong River watershed. The Mekong River is a river in the south-east of Asia. It flows through many countries: China, Burma, Thailand, Laos, Cambodia, and finally Vietnam. The Mekong begins in the Lasagongma Spring which is in the plateaus of Tibet, disputed part of China, and flows about 2,703 miles (4,350 km) south-east to the South China Sea. Its watershed covers 307,000 square miles (797,000 square kilometers). Its name comes from the Thai language's Mae Num, or literally, "Mother Water". The Mekong is one of the most biologically diverse areas in the world, with hundreds of types of fish, as well as river dolphins, crocodiles, and otters. Fishing is a very important activity on the river. However, the Mekong River is also used extensively for navigation. ↑ "Source of the Mekong River (Langcang Jiang)". Retrieved 2009-03-29. ↑ "BIodiversity and Fisheries in the Lower Mekong Basin" (PDF). Retrieved 2009-03-29. This page was last changed on 11 October 2018, at 05:25.